It was the formal launch of the Groundwala’s Android & iphone App in the football frenzy city of Pune. 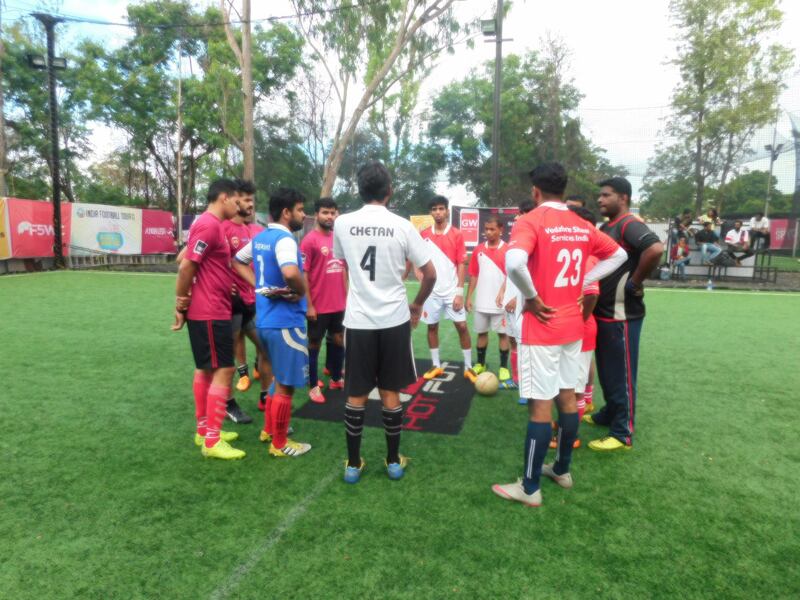 And hence we chose to start with doing back to back promotional football tournaments “GW Football Mania” and “GW Football Mania-2” in association with Score Pune and Bisleri. First of the two tournaments was scheduled for Sat, 13th Aug and a venue booked for the day was Score football Arena in Kondhwa. On the clear Saturday morning the kick off was scheduled at 9:30 am and we didn’t miss the target. As many as 14 open teams were in the fray and the teams were looking forward to the day with plenty to fight for as prizes included cash amount and GW discount coupons. Throughout the day teams played back to back matches and we witnessed some exemplary passes and jaw dropping tackles and goals. Team HSSH, Samba Boys, Gunners and TeamX made into the top four. Apart from that famous teams in the circuit like Team Juna Chawal and Team Mutant showed excellent soccer skills and derserv to proceed, but unfortunately could not make in to the knockout round. It was a worthy final between HSSH and Samba Boys. It was a closely fought game where HSSH proved themselves a better team by defeating Samba Boys by 3-1. Nitin from HSSH bagged the golden boot award with 11 goals in four games. Mr. Neeraj owner of Score arena handed over the champions trophy to the winners and cash & GW discount coupons to both the finalist. All teams went home asking for more and as a matter of the fact we were left in awe looking at the player’s fitness level, their enthusiasm and love towards the beautiful game. Next football event was exclusively for corporate and was scheduled on 27th August the last Saturday of August. 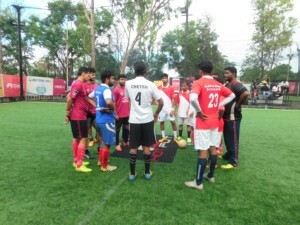 After a couple of long weekends, corporate teams were raring to have some footballing action and stage was set in Hotfut football arena in Mundhwa. The tournament was scheduled to start at 5 pm in ambient temperature so that we can have non stop action on Saturday evening. Bisleri took care of refreshment part and made sure the players remain hydrated all the time and had maximum fun. 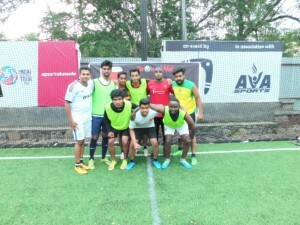 As many as 12 teams showed interest in the event and company’s like Vodafone, Volkswagon, Cognizant took part in the tournament. Football enthusiasts turned up 30 min before their match timing which is considered as a luxury for any organisor. But we doubt they are such great team keeper when it comes to going to office everyday on a serious note, we acknowledge their love and seriousness towards the game even after having such tight schedule. Right from the first match it was raining goals and colleagues who accompanied their team made sure to celebrate and support their teams in each and every moment of the game and doing all these while sipping newly launched fruity and fizzy drink Pinacolada. The atmosphere was electric by the time flood lights came into full effect, there were no signs of tiredness and players were relentless. We want to thank each and every 180 players who participated in our promotional tournaments. We are also grateful to Score Football Arena and Bisleri for supporting us and making this event successful. We will continue to work hard on making recreational sports much more accessible and memorable.